We’re well into our Super Mega Summer Scorchers Giveaway, with a heap of HUGE prizes already handed out and plenty more to be won! 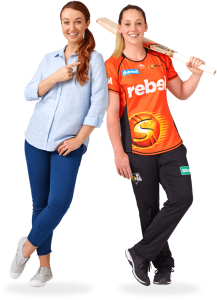 In the lead up to our competition launch, we had a ball spending the day at the WACA Ground with players from the women’s Perth Scorchers filming our latest TV advertisement. Check out the behind the scenes action from a full day’s filming – including interviews with cast and crew – plus a look at how we went about wrangling our big blue ball! With Kleenheat, you’re supporting a WA born and bred company with a commitment to our home state and a passion for supporting local. We’re proud to be the energy behind the women’s Perth Scorchers and excited to continue our Super Mega Summer Scorchers Giveaway! There’s still time to get your entry into the draw to win BIG prizes including weekly summer barbecue packs and a $20,000 Aussie getaway. Full details and entry form at kleenheat.com.au/scorchers. Go Scorchers the best from the West. One lucky winner is $100K Chock-a-Block full of cash!